Foreign-linked NGOs all across the world play an irreplaceable role in fomenting Hybrid Wars. The Law of Hybrid War states that these sorts of conflicts are manufactured identity clashes predicated on disrupting, controlling, or influencing multipolar transnational connective infrastructure projects in key transit states by means of enacting Regime Tweaking, Regime Change, or Regime Rebooting (R-TCR). These three tactics could also be described as political concessions, a ‘peaceful’ or violent leadership transition, or a fundamentally altering of the state through such means as its pressured devolution into an easily manipulatable Identity Federation. As for the sorts of identity conflicts that are expected to comprise Hybrid Wars, they can be categorized as being historical, ethnic, religious, socio-economic, and geographical (both in terms of political administrative and regional belonging). The catalyst for Hybrid War could be premeditated or happenstance, but in both instances, conflict scenarios are driven forward by the crucial public or discrete participation of foreign-linked (as in funded, managed, allied, etc.) NGOs, thereby justifying the reason why they’re being studied in this analysis alongside the latest trends in warfare. Just about all foreign-linked NGOs (hereby referred to simply as NGOs) aside from those engaged purely in humanitarian work with the explicit permission and supervision of the host state engage in preconditioning the target population to accept constructed political narratives. These mostly focus on historical, social, and/or political themes which aim to shape the mindset of the audience and contribute to the formation of absolutely new identities (e.g. “Kosovars”) or reformat existing ones (e.g. from patriotism to nationalism, or inclusive citizenship to exclusive separatist longings). NGOs work alongside new and traditional media outlets in disseminating these ideas and multiplying the effect that they have in altering their audience’s consciousness so as to promote the organization and its patrons’ predetermined objectives in fostering weaponized identity separateness. False, disreputable, and/or questionable “facts” are usually circulated among the information-media-academia triangle of communities and sympathetic operatives in order to spread new mythologies that resultantly socio-engineer the targeted demographics’ mentalities through the crafted illusion that “authoritative voices” are endorsing them. The seeds of new and/or historically debunked ideologies such as Liberalism and Nazism are planted in the minds of the audience and watered with a steady stream of supportive information designed to increase their appeal and build the foundation for the forthcoming anti-government gambit. After becoming indoctrinated with Liberalism, for example, one might become more susceptible to playing the role of a “useful idiot” and aggressively demonstrating against their government, while believers in Nazism and World War II-era “nationalism” might become emboldened to carry out hateful provocations against their historical ‘enemies’. Both categories of ideological imprinting are thus equally useful in promoting set political objectives within the targeted state, with the promoted foundation being dependent on what the exact end game conflict is envisioned to be. Liberalism is more amenable to the formation of new identities for separatist purposes, whereas Nazism (or “extreme nationalism” to generalize) has a role to play in generating furious anti-government hate and provoking interstate conflict (e.g. Croatian Ustasha obsessively trying to destabilize Bosnia and the Serbian Province of Vojvodina). 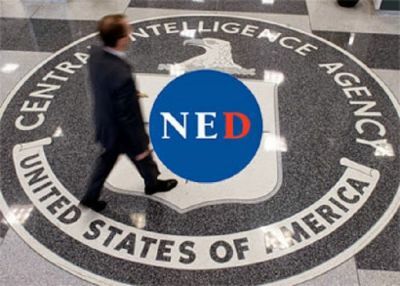 The US government funds organizations such as the “National Endowment For Democracy” (self-described in 1991 as openly doing what the CIA used to covertly pull off 25 years before then) in order to behave as public-private intelligence fronts abroad, blending professional operative experience with a civilian “plausible deniability”. Certain companies may have an interest in independently deploying their own NGOs, whether to lobby on behalf of their commercial interests or to agitate against their opponents, with this potentially escalating to the level of putting R-TCR (Regime – Tweaking, Change, Reboot) pressure on one or another government for these purposes. “Private” donors such as George Soros and the Saudi Princes operate the Soros Foundation and “Islamic charities” respectively (the latter being the first large-scale weaponized worldwide NGO network during the 1980s Afghan War period), with their organizations having spread all across the globe by this point and sometimes working to promote their shadowy interests hand-in-hand with selected government clients. Each of these three different sources provide seed funding and training to their on-the-ground proxies, with the desire being that they’ll succeed in cultivating a community of fifth and sixth columnists to aid with their goals. Organizational training and organizing techniques are pivotal because of how strongly they influence a group’s effectiveness, since at the end of the day, it’s usually just the small core membership that truly counts since their affiliated cohorts and civilians are either volunteers or low-cost temporary expenses. NGOs are also very useful to their patrons because they function as middlemen facilitators in giving bribes and conveying blackmail to different private individuals (e.g. journalists) and political figures, and if they operate in a ‘laissez faire’ environment, then they could also valuably partake in different scales of money laundering activities to these ends or in support of their backers’ pecuniary interests. Even if they get caught, the single degree of separation that they “plausibly” enjoy from their sponsors due to their allegedly “independent” status is enough to insulate their supporters from any “official” blame. NGOs have learned to employ local faces and personnel for staffing their foreign offices, understanding that this helps to deflect any immediate criticism of their foreign ties as well as confuse naïve ‘investigative reporters’ who only superficially look at the passports of the people working there in drawing their determinations. In reality though, this policy is actually less about obscuring the said NGOs links to abroad than it is about duping the populace that they plan on interacting with, since dedicated sleuths are usually successful at uncovering the financial, communication, and personal connections that link an investigated organization to a foreign entity. 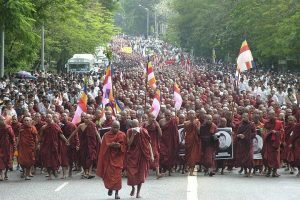 Regular individuals on the street, however, might not have any idea that their fellow citizen passing out anti-government fliers and encouraging them to join a protest might be in the employ of foreign entities, even if some of the group’s staff themselves aren’t even aware of this. The disingenuity that comes with tricking people into joining an activity or organization due to the fact that the foreign ties behind it are deliberately obscured proves that the initiative’s backers knowingly accept that locals would likely shy away from these sorts of things if they knew that they were sponsored from abroad. Because many of them otherwise have no idea about this, however, they’re more susceptible to being misled into participating. 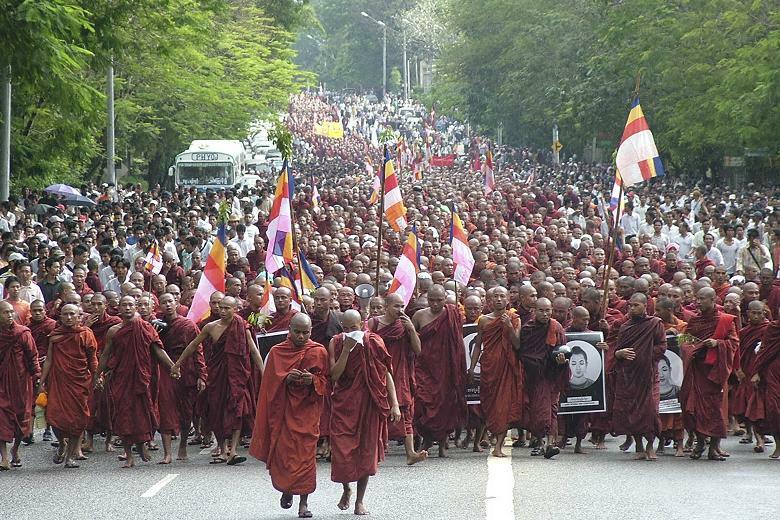 Along the lines of NGO figureheads, it should relatedly be mentioned that the leaders of the eventual anti-government government are sometimes pastors (Zimbabwe), monks (Myanmar, the Tibet Autonomous Region), or students (‘traditional’ Color Revolutions), all of which have an international reputation as being seemingly innocuous and harmless. No matter if this was actually true before The Event (the specifics of which will be described soon) or not, the fact is that the moment that these purportedly peaceful actors begin aggressively demonstrating against the government, provoking conflict with the police and military, and sometimes even attacking law enforcement officers and public & private property, they’ve forfeited their right to be responded to in a non-violent fashion, thus justifying the authorities’ decisive (and sometimes heavy-handed) crowd control techniques. These figureheads also play another complementary role as well, and it’s to promote their presumably peaceful reputations through collusive media channels that have an interest in portraying these individuals as “calm pro-democracy protesters” so as to selectively edit and deliberately misreport their provoked clashes with the authorities as being the result of an “unpopular and power-hungry dictatorship killing its own people”. Never mind that none of this is factually true, but it’s the purposeful misperception that counts because of the ease with which such manufactured narratives can quickly blow a local, regional, or national event completely out of proportion in order to rapidly turn it into an “international crisis” that prompts foreign governments to put much-publicized pressure on the targeted state. The one tactic that all politically affiliated NGOs (whether openly stated or secretly of this disposition) end up pursuing is to eventually put pressure on their host government in a bid to make it more “democratic”. The reason why “democracy” is such an obsession for these organizations and their backers doesn’t necessarily have anything to do with its inherent ‘normative’ qualities (most often of the Western iteration of this ideology), but with its convenient structure in regularly phasing out leadership cycles. Western-influenced ‘democracies’ have predictable election cycles which are understood in the Theory of Hybrid War as representing nothing more than ‘peaceful’ opportunities for regime change, ergo the frantic activity that NGOs engage in before, during, and immediately after this time. Western ‘democracy’ is also marked by the inseparable political culture of lobbyists (legal bribers) and commercially driven mainstream media outlets, which makes it all the much easier for foreign actors and their local NGO pawns to interfere with the ‘democratic’ process and hijack it in the direction of their aims. If elections don’t result in the desired outcome that the NGOs and their international backers are seeking, or if the next electoral cycle isn’t for a few years and these actors grow impatient and/or believe that the window for achieving their political ends might close by that time, then they’ll conspire to engineer an Event that puts pressure on the government to embark on R-TCR under the omnipresent threat of Hybrid War. Examples of the type of pressure that could be brought to bear against the authorities are election-related drama, corruption scandals (possibly sparked by NSA-‘leaked’ wiretaps and/or documents like Brazil’s ‘Constitutional Coup’ and the failed Macedonian Hybrid War attempt), disruptive ‘civil society’ movements (e.g. Armenia’s “Electric Yerevan”), and the politicization of controversial deals (e.g. Ukraine’s EU Association Agreement) that attempt to force a new or early round of elections. If the government doesn’t tweak, change, or reboot after experiencing the ‘peaceful’ Color Revolution coercion that the foreign interests and their NGO foot soldiers try to ‘democratically’ force upon it, then the foreign government(s) behind the charade might take the decision to commence Hybrid War by transitioning the Color Revolution to an Unconventional War. It’s not always guaranteed that this will be the case, since sometimes certain Color Revolution disturbances aren’t fully backed up by their foreign sponsors and NGO network and are instead test probes for assessing structural vulnerabilities, responses, and other sorts of valuable intelligence that could come in handy in a future R-TCR scenario that’s more determinately supported for these purposes. After all, if the state is strong enough to defend against this asymmetrical attack using Democratic Security measures and/or the future insurgency lacks the long-term viability to sustain a successful R-TCR Hybrid War campaign (perhaps if an effective “Lead From Behind” regional arrangement can’t be constructed in time), then the foreign backers might pull out their support for the unrest and wait until another future opportunity could be engineered at a more decisive moment. When the Color Revolution undergoes the phased transition into Hybrid War by evolving into an Unconventional War, there’s a lot of the former behind-the-scenes structural arrangement that simply stays the same but under a different name. Many of the NGO networks and their personnel transition into armed insurgents or provide the fighters with informational, organizational, logistical, and/or material support. Although the tactics of R-TCR have changed, the principle still remains the same, though with a noticeable and less covert influx of foreign assistance (insurgents, weapons) in pursuit of these ends. Not all foreign-linked NGOs and their workers might partake in these openly seditious activities, but it’s a fair bet that many of them will to some extent or another, since after all, the only difference between the Color Revolutionaries and their Unconventional Warfare counterparts are the means which they’re willing to employ in achieving their shared goal, with ‘each hand washing the other’ in carrying out complementary tasks to this end. Hybrid War is the latest form of aggression being waged by unipolar forces against the emerging Multipolar World Order, and the indirect way in which it’s practiced shields the perpetrator from immediate repercussions and thus increases the attractiveness of this stratagem. Seeing as how the reliance on Hybrid War as a foreign policy instrument shows no signs of realistically abating for the foreseeable future due to the novel and cost-effective nature in which it’s applied, there’s a pressing urgency to understand every facet in which it’s fought, ergo the pertinence in exposing the pivotal role that NGOs play in this process. Remembering that Hybrid Wars are premised on the outside instigation and subsequent manipulation of identity conflict in a targeted transit state along the route of a prominent multipolar transnational connective infrastructure project, then it’s much easier to conceptualize the function that hostile foreign-linked NGOs have in putting this sequence of ‘controlled chaos’ into motion. These groups are tasked with provoking a sense of identity separateness among the population, a socially engineered sentiment which the organizers envision will eventually turn patriotic citizens into anti-government sympathizers. The NGO networks and local personnel that participate in this foreign-assisted scheme and aspire to disrupt, control, or influence these aforementioned infrastructure projects through varying degrees of R-TCR pressure against the authorities usually transition into insurgents and other forms of asymmetrical threats when their failed Color Revolution tactics begin phasing into an enhanced Unconventional Warfare form. Since foreign-linked NGOs are the vanguard forces spearheading the latest iteration of Hybrid War all across the world, it’s in the best interests of every responsible government to place supervisory checks and operative restrictions on these groups in order to neuter their offensive capabilities and ensure national security. Andrew Korybko is the author of “Hybrid Wars: The Indirect Adaptive Approach To Regime Change” (2015).